Light blue - 3 3/4" by 5 1/2"
Fill the waterbrush with bleach and very carefully paint the inside sections of each leaf. As the bleach dries the blue will lighten. Repeat until the inside of each leaf is close to white. Leave the piece to dry thoroughly. Using the EK Success border punch, Punch along one of the long sides on both pieces of white card stock. 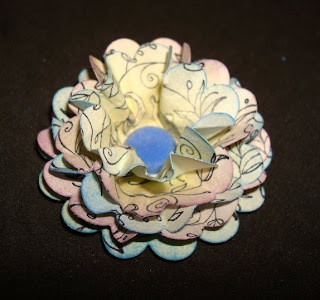 Attach dark blue piece to the centre of the folded brown card. 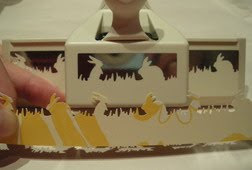 Using the Martha Stewart Double scalloped punch, punch along the long edge of the light blue card. Using the watercolour pencils, colour each leaf, blending different shades to give a more realistic effect. Don’t be too concerned with it being perfect as you will be blending over with a waterbrush when you are finished. 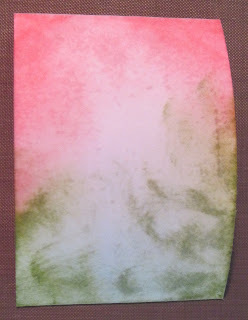 (If possible use a second waterbrush for the water as it can be difficult to remove all traces of the bleach). Attach the white strips behind the punched edges of the light blue card and trim off any overhang. 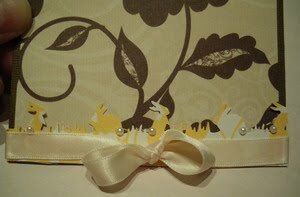 Scatter some of the clear flowers across the leaves and secure in place with one of the brads. Note: I used a paper that is not available. They are a pretty yellow which will match the border. Note: These micro mono stickers are GREAT! They give you a LOT of letters both lower and upper case. 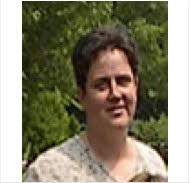 They are also cardstock and easy to handle. 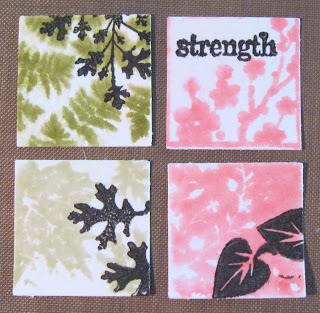 They are just the right size for adding sentiments on tags! 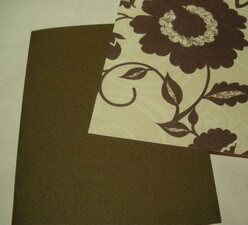 Fold the dark brown cardstock in half to make your base card. 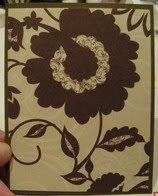 Cut the brown pattern cardstock to 4x5 ¼. Layer this onto your card. Punch the strip of yellow patterned card-stock. 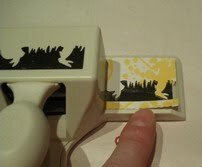 Place the strip of yellow patterned cardstock into the punch. I find it easier to work with the handle next to me (although the design is upside down). You can work left to right or right to left; I work left to right. Make sure that the edge of the paper is flush against the lip of the punch. 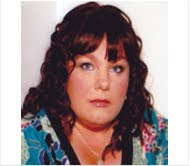 This assures that you will have a straight border when you’re done. Press the handle down and make your first punch. Pull the paper to the right. You can see the punched pattern. Match the pattern you have punched to the pattern on the punch itself, and that the paper is flush against the lip of the punch. Repeat pulling paper to the right and puncing until you have punched a 6 inch length of this border. 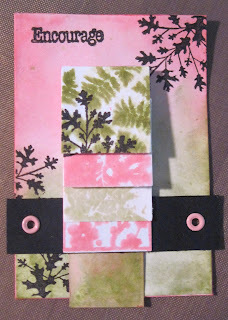 Lay your punched border along the base of your card and cut the excess off. Glue the ribbon to the bottom of the border strip. Glue the border/ribbon to the base of your card. Add 3mm white pearls to the punched bunnies for their tails. 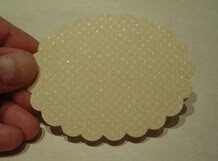 Punch a scalloped oval out of glitter cardstock. 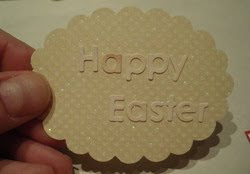 Add Happy Easter in cardstock letters to the oval. Punch a small hole in the lower left of the oval. 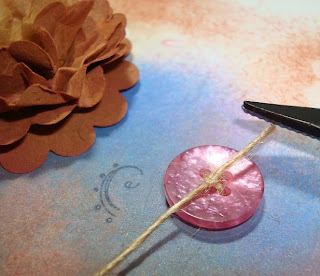 Place a small brad through the center of a purple flower and attach the flower to the oval. Add a 5mm white pearl to the top of the brad. Place mounting tape on the back of your oval. 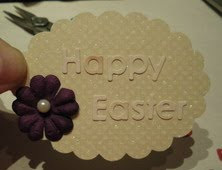 Attach your oval to your Easter card. 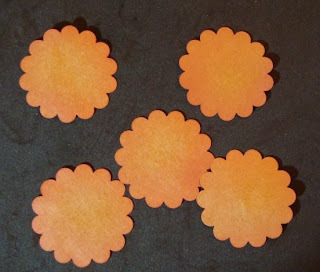 Start by punching five (5) scalloped circles from a brown grocery bag. 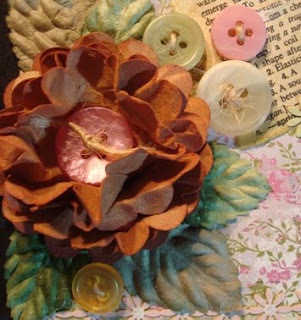 To add depth to the flower, stipple the edges of the scalloped circles with ColorBox Fluid Chalk Ink (Burnt Sienna). Stack your five scalloped circles together and pierce a hole in the center of the stack with a piercing tool or awl. Insert and secure the stack with a mini brad. You can use any color of brad as it will be hidden under your decorative flower center. Take the top scalloped circle and start folding it up toward the center. Give it a good scrunching. Follow the same procedure with each additional scalloped circle. When you are done folding all layers to the center of the flower, you will want to start pulling the layers away from the center and flattening the flower somewhat. 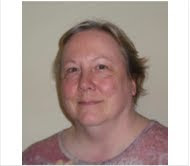 Just keep folding and bending the layers until you have the look you want. The brown grocery bag works great for this flower as it is heavy enough to hold the flowers shape, yet softens just enough to give the flower a very soft look and feel. 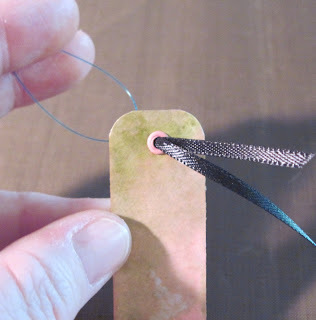 Thread your vintage looking button with some twine. 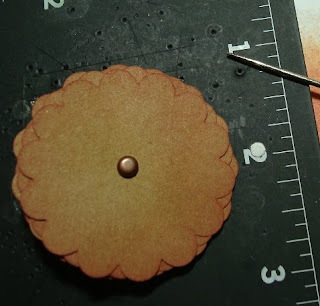 Using a couple of glue dots add the button to the center of your flower (directly over the mini brad). 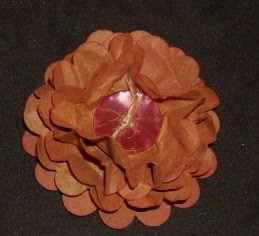 Your paper bag flower is now done and ready to be used on any project where you want a beautiful dimensional flower. 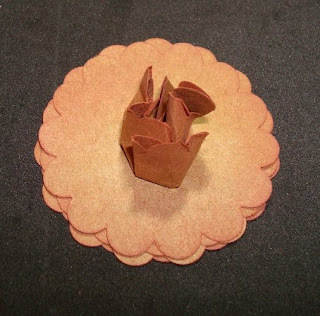 I wanted to show some variations to the paper bag flower. Here are two variations using the same basic assembly instructions. 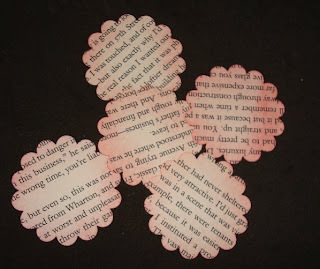 These flowers can be made with many kinds of paper, in just about any color combination, and in many different sizes. Try using buttons, jewels, brads, etc. for flower centers. 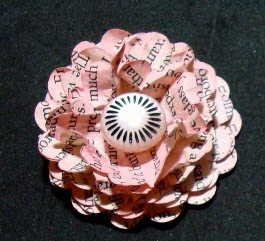 The first flower variation is using text pages from an old novel. 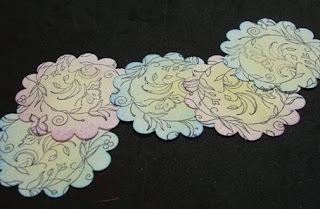 I stippled the punched scalloped circles using ColorBox Fluid Chalk Ink (Orchid Pastel). I assembled the flower in the same manner using a button for the center of the flower. The second variation is made from plain heavyweight cream colored text paper. I stamped a design on the paper before punching. I stippled the punched scalloped circles using ColorBox Fluid Chalk Ink (Wisteria and Blue Lagoon). Instead of using a mini brad to hold my stack of circles together, I used a full sized Making Memories velvet brad ( MM-BR-29663 $4.99 .) This serves as the finished center of this flower. 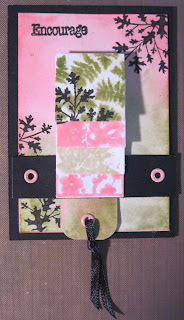 This is a project that is quick to do and easy enough for stampers of any level, yet pretty enough to wow anyone! 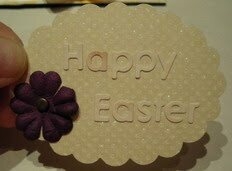 • On the front of the card, mask off a rectangle on the card, using the post it notes. Hope you’ll give this project a try! My stamping style may be a little deceptive; I love to make cards that look clean and simple, or perhaps elegant, and I love to layer. And often, that is all that there is to my creations. 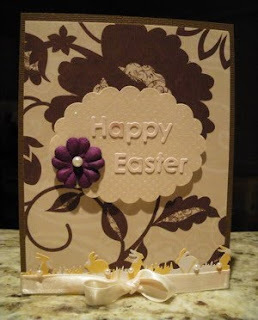 But sometimes my simple looking cards have a bit of a twist, quite literally; I just love to make my cards “DO” something! I remember my first pop-up book from my childhood, and I often try to recapture the fascination of that book in my cards. 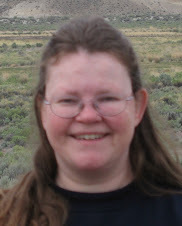 Many of my creations pop-up, spin, move, or change in some way, as you may have gathered from my guest blogger posts. I am enthralled with paper engineering and hope to be able to share some with you, along with, perhaps, some of those simpler cards. Years ago I created a template for a waterfall card for a standard sized card. This template involved a lot of complicated cutting and folding, and was moderately difficult to make. That template made the rounds of the stamping community after I posted it on a now defunct web site I hosted. Several years later, the waterfall card made a comeback with a much easier to make version that involved a strip of cardstock for the waterfall mechanism, and another strip, attached to the card with eyelets. 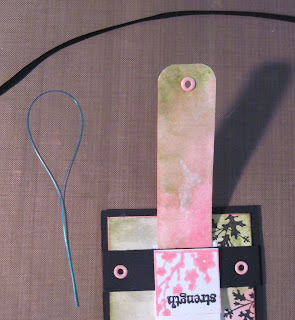 Here is yet another version... downsized to fit on an ATC and using Inchies. 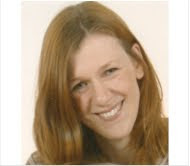 I hope you'll enjoy it and give it a try! 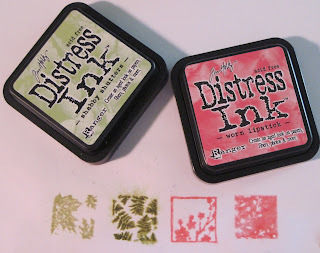 Using black ink, stamp your choice of leaves from the set on three of the inchies, stamping off the edge. Stamp "Strength" on the fourth of the inchies. 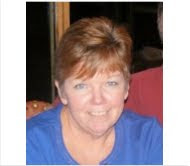 Set the inchies aside. 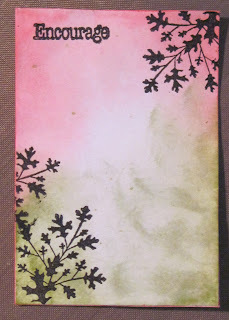 With the black ink pad, stamp some leaves onto the 2 1/4" x 4 1/4" rectangle of card-stock, over the sponged on ink. 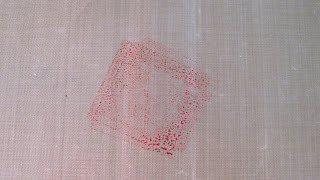 Press the Worn Lipstick ink pad onto the non-stick sheet to make a square of ink. 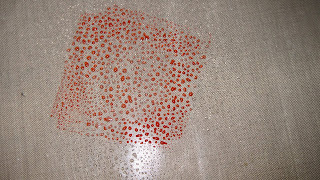 Spritz with water until the ink begins to form droplets. 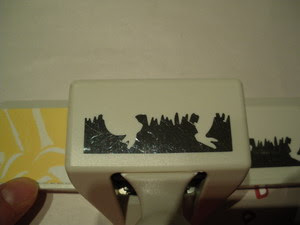 Press the long strip of white card-stock into the ink, front and back. Wipe off non-stick sheet with paper towel. Repeat with the Peeled Paint ink. Set aside to dry. Using the Score Board, score the long strip (the mechanism) at 1", 1 3/8", 1 3/4", and 2 1/8". Mountain fold at each of the score lines, but open the mechanism, and lay flat. Holding the mechanism so that the scores are toward the right end of the strip, apply a small piece of the red liner tape to the immediate right of each of the scores. Remove the liner from the next piece of tape. 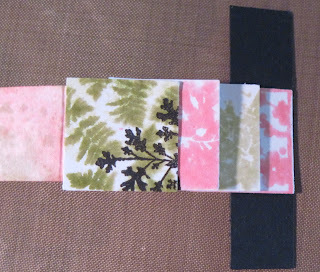 Attach another inchie (alternating colors) to that piece of tape, lining the edges of the inchie with the one below it, and again making sure the edge is close to the score. Repeat with the final two pieces of tape and inchies. Adhere the 1/2" x 2 1/4" strip of black card-stock to both the back of the first placed inchie, and the part of the mechanism that extends under the inchie. Make sure the black strip is centered on the mechanism. Rotate the mechanism 90° clockwise. Fold the mechanism back at the top-most score. Using two of the three eyelets, attach the black strip to the 2 1/4" x 3 1/4" rectangle, aligning the bottoms of the mechanism and the rectangle. Glue the smaller rectangle, with its attached mechanism, to the black rectangle. Round both corners of the extended end of the mechanism. Set an eyelet near that end. Use the floss threader to pass the ribbon through the eyelet by first placing its pointed end into the hole of the eyelet, then threading the ribbon through the eye of the threader, and then pulling the threader through the eyelet. Tie a knot in the ribbon, close to the end of the mechanism. 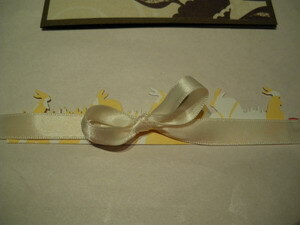 Trim the ends of the ribbon. In order to make the "water fall", pull on the ribbon, gently and slowly. The inchies will cascade up, and then behind the mechanism. I hope you've enjoyed today's project, and that you'll give it a try. This mechanism will work with ANY inchies you might want to make. The ATC can be traded as is, or be attached to a card.